Ystäväni Tero Isokauppila kiteytti kiitettävästi käymämme keskustelun Ludwig von Misesistä ja ihmisen toiminnasta tavoitteellisena toimijana kiitettävästi omassa itsensä johtamista käsittelevässä Neti Neti-blogissaan. Kannattaa käydä lukemassa! Ihmisen toiminta on aina tavoitteellista. Ihmisen tavoitteet voivat olla joko tiedostettuja tai tiedostamattomia. Ihmisen tavoitteen määräytyvät ihmisen arvoista. Ihminen antaa arvostamilleen asioille arvoa. Motivaatio tavoitella ihmisen arvostamia asioita on psykologiaa. Ihmisen arvot näkyvät hänen toiminnassaan valintoina. Ihminen pyrkii kohti päämääriään valitsemalla asioista, joiden uskoo vievän kohti tavoitteitaan. Ihminen tavoittelee myös mahdottomia. Sitä käsittelee utopia. Ihmisen parempi tietoisuus arvoistaan parantaa hänen kykyään asettaa tavoitteitaan. Ihmisen parempi tietoisuus tavoitteistaan parantaa hänen toiminnassaan tekemiä valintojaan. Ihmisen paremmat valinnat johtavat hänen itsensä tavoittelemaan parempaan elämään. On parempi olla tiedostettuja tavoitteita kuin tiedostamattomia tavoitteita. Molempia on aina, mutta parempi tietoisuus omista tavoitteistaan ja tavoitteiden prosessointi kirkastavat valintoja. Siksi itsensä johtaminen ja tavoiteprosessi ovat sekä toimivia tavoitteiden täyttymisen kannalta että hyväksi ihmisen omalle kasvulle. Ihminen on pystynyt parantamaan elinolosuhteitaan kykenemällä "jalostamaan" tavoitteitaan primitiivisistä haluista korkeampiin päämääriin. Usein tämä kyky on yhä kehityksen edellytys. Onko tavoite yhtä kuin suunnitelma? Ihmisen tavoite toteutuu aina käytännön valinnoissa. Kaikkia käytännön eteen tulevia valintoja ei voi tietää etukäteen. Tulevaisuus on aina ja kaikille epäselvä. Siispä ei ole olemassa täydellistä suunnitelmaa. Tavoite on enemmän päämäärä ja periaate kuin suunnitelma. Tavoitteet muuttuvat ihmisen arvojen muuttumisen myötä. Siispä, on parempi kuvata maali kuin polku. "Has more than US 1 trillion in development assistance over the last several decades made African people better off? No. In fact, across the globe the recipients of this aid are worse off: much worse off. Aid has helped make the poor poorer, and growth slower. Yet aid remains a centerpiece of today’s development policy and one of the biggest ideas of our time… Aid has been, and continues to be, an unmitigated political, economic, and humanitarian disaster for most parts of the developing world." 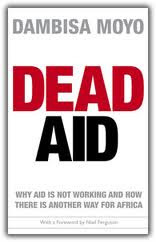 This is the main critics that Dambisa Moyo presents in her famous book Dead Aid – Why aid is not working and how there is another way for Africa. Personally, I was pleased to read a well structured and analyzed critics of the present aid system. For example in Finland, aid seems to be a tabu and we are lacking a critical analysis of the benefits of aid system. 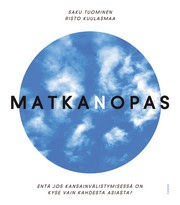 Funny thing is that both Erkki Tuomioja and Björn Wahlroos have recommended this book. Moyo makes several interesting points by stating that actually aid is a problem, not a solution for the poverty. As Moyo highlights, over the past thirty years, the most aid-dependent countries have exhibited growth rates averaging minus 0.2 per cent per annum. For most countries a direct consequence of the aid-driven interventions has been a dramatic descent into poverty. With respect to aid, poor economies face four main economic challenges: reduction of domestic savings and investment in favour of greater consumption; inflation; diminishing exports; and difficulty in absorbing such large cash influxes. Foreign aid does not strengthen the social capital – it weakens it. By thwarting accountability mechanisms, encouraging rent-seeking behavior, siphoning off scale talent from the employment pool, and removing pressures to reform inefficient policies and institutions, aid guarantees that in the most aid-dependent regimes social capital remains weak and the countries themselves poor. Aid inflows have adverse effects on overall competitiveness, wages, export sector employment and ultimately growth. Finally, economic researchers have found that countries with low financial development do not have the absorptive capacity for foreign aid. Born in Africa, Moyo focuses on analyzing Africa as an example. She says that Africa’s broad economic experience shows that the abundance of land and natural resources does not guarantee economic success, however. In the second half of the twentieth century, natural-resource dependence has proved to be a developmental curse, rather than blessing. According to Moyo, Africa’s failure to generate any meaningful or sustainable long-run growth must, ostensibly, be a confluence of factors: geographical, historical, cultural, tribal and institutional. However, it is also fair to say that no factor should condemn Africa to a permanent failure to grow. Africa is not an absence of cash, but rather that its financial markets are acutely inefficient – borrowers cannot borrow, and lenders do not lend, despite the billions washing about. No country has economically succeeded without finding a way to funnel the risk capital to finance its small and medium-sized enterprises. For Africa, this is an imperative that must be heeded. Moyo says that doing business in Africa is a nightmare. There are hurdles for investors to overcome. For the most part infrastructure is scant, and of poor quality, making the costs of overall production of goods and services steep – which explains why it is cheaper to make almost anything in Asia and ship It to Europe, than produce it in Africa, although the continent is much closer. However, physical constraints are nothing compared with man-made disincentives: widespread corruption, a maze of bureaucracy, a highly circumscribed regulatory and legal environment, and ensuing needless streams of red-tape. African countries impose an average tariff of 34 per cent on agricultural products from other African nations, and 21 per cent on their own products. As a result, trade between African countries accounts for only 10 per cent of their total exports. By contrast, 40 per cent of North American trade is with other North American countries and 63 per cent of trade by countries in Western Europe is with other Western European countries. The privatization of African state-owned enterprises across all sectors meant that the government stake of corporate equity fell from almost 90 per cent to just 10 per cent ownership in six years. The free markets gave African economies the freedom to succeed, but also the freedom to fail. As well Moyo points out that there is, of course, the largely unspoken and insidious view that the problem with Africa is Africans – that culturally, mentally and physically Africans are innately different. That, somehow, deeply embedded in their psyche is an inability to embrace development and improve their own lot in life without foreign guidance and help. "What if, one by one, African countries each received a phone call telling them that in exactly five years the aid taps would be shut off – permanently?" According to Moyo without the inbuilt threat that aid might be cut, and without the sense that one day it could be over, African governments view aid as a permanent, reliable, consistent source of income and have no reason to believe that the flows won’t continue into the indefinite future. There is no incentive for long-term financial planning, no reason to seek alternatives to fund development, when all you have to do is to sit back and bank the cheques. Aid has been the key tool in the contest to turn the world capitalist or communist. Lately, with Bono and other populist, the pop culture of aid has bolstered misconceptions. Aid has become part of the entertainment industry. As well as popular, aid has become a big business. The World Bank employs 10 000 people, the IMF over 2500, add another 5000 for UN agencies; add to that the employees of at least 25 000 registered to NGOs, private charities and the army of government aid agencies; taken together around 500 000 people, the population of Swaziland. Sometimes they make loans, sometimes they give grants, but they are all in the business of aid. Donors have the added fear that were they not to pump money in, poor countries would not be able to pay back what they already owe, and this would affect the donors’ financing themselves. This circular logic is exactly what keeps the aid merry-go-round humming. There are three fundamental truths about conflicts today; they are mostly born out of competition for control of resources; they are predominately a feature of poorer economies; and they are increasingly internal conflicts. According to Moyo, what is clear is that democracy is not the prerequisite for economic growth that aid proponents maintain. On the contrary, it is economic growth that is a prerequisite for democracy; and the one thing economic growth does not need is aid. She continues by saying that in early stages of development it matters little to a starving African family whether they can vote or not. Later they may care, but first of all they need food for today, and the tomorrows to come, and that requires an economy that is growing. Trade creates employment, improves trade balances, lowers the price of consumer goods through greater imports and generates income for the country’s exporters, but, perhaps most importantly, trade produces income that accrues to governments through tariffs and income taxes. Countries that have developed – in Europe, America, Japan, Asian countries like Taiwan, Korea and Singapore – have all believed in free markets. Moyo asks, is it possible for a government to raise money in a free-market way and spend it on a socialist agenda? Her answer is yes: Sweden, Denmark and Norway are just three examples. Whatever the social, political and economic ideology a country chooses, there is a menu of financial alternatives, all better than aid, that can finance its agenda. A World Bank study found that as much as 85 per cent of aid flows were used for purposes other than that for which they were initially intended, very often diverted to unproductive, if not grotesque ventures. When it comes to remittances, for every USD 100 sent to Africa, only USD 80 gets there – the middleman takes the rest – while from the US to Mexico USD 85 gets home and from the UK to India as much as USD 96 reaches its destination. Do corrupt governments receive less foreign aid? Alesina and Weder conclude that aid tends to increase corruption. Svensson show how aid fosters corruption by reducing public spending; that by increasing government revenues, aid lowers the provision of public goods (things that everyone benefits from, but no one wants to pay for). Corrupt governments interfere with the rule of law, the establishment of transparent civil institutions and the protection of civil liberties, making both domestic and foreign investment in poor countries unattractive. Greater opacity and fewer investments reduce economic growth, which leads to fewer job opportunities and increasing poverty levels. Chinese are coming. And it is in Africa that their campaign for global dominance will be solidified. Economics come first, and when they own the banks, the land and the resources across Africa, their crusade will be over. They will have won. The mistake the West made was giving something for nothing. The secret of China’s success is that its foray into Africa is all business. China, on the other hand, send cash to Africa and demands returns. With returns Africans get good jobs, get roads, get food, making more Africans better off, and the promise of some semblance of political stability. It is the economy that matters. In the last sixty years, no country has made as big an impact on the political, economic and social fabric of Africa as China has since the turn of the millennium. China’s economy has grown as much as 10 per cent a year over the past ten years, and it desperately needs the resources that Africa can provide. But rather than conquer Africa through the barrel of a gun, it is using the muscle of money. China has invested billions in copper and cobalt, in the Democratic Republic of Congo and Zambia, in iron ore and platinum in South Africa; in timber in Gabon, Cameroon and Congo-Brazzaville. It has also acquired mines in Zambia, textile factories in Lesotho, railways in Uganda, timber in the Central African Republic and retail developments across nearly every capital city. However, oil is the gusher. In total African countries provided roughly 30 per cent of China’s crude oil imports, Angola being the biggest supplier. No one can deny that China is at least in Africa for the oil, the gold the copper and whatever else lies in the ground. But to say that the average African is not benefiting at all is a falsehood, and the critics know it. More people view China’s influence positively than make the same assessment of US influence. First, African governments should follow Asian emerging markets in accessing the international bond markets and taking advantage of the falling yields paid by sovereign borrowers over the past decade. Second, they should encourage the Chinese policy of large-scale direct investment in infrastructure. Third, they should continue to press for genuine free market in agricultural products, which means that the U.S., the EU and Japan must scrap the various subsidies they pay to their farmers, enabling African countries to increase their earnings from primary product exports. Fourth, they should encourage financial intermediation. Specially, they need to foster the spread of microfinance institutions of the sort that have flourished in Asia and Latin America. They should follow the Peruvian economist Hernando de Soto’s advice and grant the inhabitants of shanty towns secure legal title to their homes, so that these can be used as collateral. And they should make it cheaper for emigrants to send remittances back home. Ideally African countries should aim for just 5 per cent of their total development financing coming from aid, 30 per cent from trade, 30 per cent from foreign direct investments, 10 per cent from capital markets and 25 per cent that is left should emanate from remittances and harnessed domestic savings. 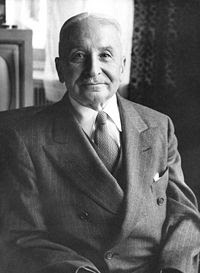 In the middle of a financial crisis caused by public debts, I was shocked to read Ludwig von Mises' Human Action and what von Mises says about public debts. Here is one chapter, which couldn't fit better in this situation. The best thing is that this text was published in 1949. Economic calculation does not require monetary stability in the sense in which this term is used by the champions of the stabilization movement. The fact that rigidity in the monetary unit's purchasing power is unthinkable and unrealizable does not impair the methods of economic calculations. What economic calculation requires is a monetary system whose functioning is not sabotaged by government interference. The endeavors to expand the quantity of money in circulation either in order to increase the government's capacity to spend or in order to bring about a temporary lowering of the rate of interest disintegrate all currency matters and derange economic calculation. The first aim of monetary policy must be to prevent governments from embarking upon inflation and from creating conditions which encourage credit expansion on the part of banks. But this program is very different from the confused and self-contradictory program of stabilizing purchasing power. For the sake of economic calculation all that is needed is to avoid great and abrupt fluctuations in the supply of money. Gold and, up to the middle of the nineteenth century, silver served very well all the purposes of economic calculation. Changes in the relation between the supply of and the demand for the precious metals and the resulting alterations in purchasing power went on so slowly that the entrepreneur's economic calculation could disregard them without going too far afield. Precision is unattainable in economic calculation quite apart from the shortcomings emanating from not paying due consideration to monetary changes. The planning businessman cannot help employing data concerning the unknown future; he deals with future prices and future costs of production. Accounting and bookkeeping in their endeavors to establish the result of past action are in the same position as far as they rely upon the estimation of fixed equipment, inventories, and receivables. In spite of all these uncertainties economic calculation can achieve its tasks. For these uncertainties do not stem from deficiencies of the system of calculation. They are inherent in the essence of acting that always deals with uncertain future. The idea of rendering purchasing power stable did not originate from endeavors to make economic calculation more correct. Its source is the wish to create a sphere withdrawn from the ceaseless flux of human affairs, a realm which the historical process does not affect. Endowments which were designed to provide in perpetuity for an ecclesiastic body, for a charitable institution, or for a family were long established in land or in disbursement of agricultural products of kind. Later annuities to be settled in money were added. Endowers and beneficiaries expected that an annuity determined in terms of a definite amount of precious metals would not be affected by changes in economic conditions. But these hopes were illusionary. Later generations learned that the plans of their ancestors were not realized. Stimulated by this experience they began to investigate how the aims sought could be attained. Thus they embarked upon attempts to measure changes in purchasing power and to eliminate such changes. The problem assumed much greater importance when governments initiated their policies of long-term irredeemable and perpetual loans. The state, this new deity of the dawning age of statolatry, this eternal and superhuman institution beyond the reach of earthly frailties, offered to the citizen an opportunity to put his wealth in safety and to enjoy stable income secure against vicissitudes. It opened a way to free the individual from the necessity of risking and acquiring his wealth and his income anew each day in the capitalist market. He who invested his funds in bonds issued by the government and its subdivisions was no longer subject to the inescapable laws of the market and to the sovereignty of the consumers. He was no longer under the necessity of investing his funds in such a way that they would best serve the wants and needs of the consumers. He was secure, he was safeguarded against the dangers of the competitive market in which losses are the penalty of inefficiency; the eternal state had taken him under its wing and guaranteed him the undistributed enjoyment of his funds. Henceforth his income no longer stemmed from the process of supplying the wants of the consumers in the best possible way, but from the taxes levied by the state's apparatus of compulsion and coercion. He was no longer a servant of his fellow citizens, subject to their sovereignty; he was a partner of the government which ruled the people and exacted tribute from them. What the government was far outweighed by the unquestionable solvency of the debtor, the state whose revenue did not depend on satisfying the public, but insisting on the payment of taxes. In spite of the unpleasant experiences with public debts in earlier days, people were ready to trust freely the modernized state of nineteenth century. It was generally assumed that this new state would scrupulously meet its voluntary contracted obligations. Capitalists and entrepreneurs were fully aware of the fact that in the market society there is no means of preserving acquired wealth other than by acquiring it anew each day in tough competition with everybody, with already existing firms as well as with newcomers "operating on a shoe string". The entrepreneur, grown old and weary and no longer prepared to risk his hard-earned wealth by new attempts to meet the wants of consumers, and the heir of other people's profits, lazy and fully conscious of his own inefficiency, preferred investment in bonds of the public debt because they wanted to be free from the law of the market. Now, the irredeemable perpetual public debt presupposes the stability of purchasing power. Although the state and its compulsion may be eternal, the interest paid on the public debt could be eternal only if based on a standard of unchanging value. In this form the investor who for security's sake shuns the market, entrepreneurship, and investment in free enterprise and prefers government bonds is faced again with the problem of the changeability of all human affairs. He discovers that in the frame of a market society there is no room left for wealth not dependent upon the market. 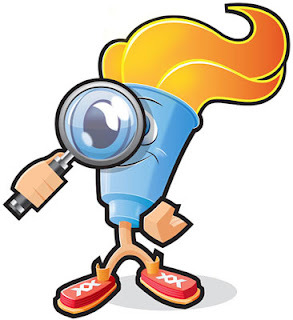 His endeavors to find an inexhaustible source of income fail. There are in this world no such things as stability and security and no human endeavors are powerful enough to bring them about. There is in the social system of the market society no other means of acquiring wealth and of preserving it than successful service to the consumers. The state is, of course, in a position to exact payments from its subjects and to borrow funds. However, even the most ruthless government in the long run is not able to defy the laws determining human life and action. If the government uses the sums borrowed for investment in those lines in which they best serve the wants of consumers, and if it succeeds in these entrepreneurial activities in free and equal competition with all private entrepreneurs, it is in the same position as any other businessman; it can pay interest because it has surpluses. But if the government invests funds unsuccessfully and no surplus results, or if it spends the money for current expenditure, the capital borrowed shrinks or disappears entirely, and no source is opened from which interest and principal could be paid. Then taxing the people is the only method available for complying with the articles of the credit contract. In asking taxes for such payments the government makes the citizens answerable for money squandered in the past. The taxes paid are not compensated by any present service rendered by the government's apparatus. The government pays interest on capital which has been consumed and no longer exists. The treasury is burdened with unfortunate results of past policies. A good case can be made out of short-term government debts under special condition. Of course, the popular justification of war loans is nonsensical. All the materials needed for the conduct of a war must be provided by restriction of civilian consumption, by using up a part of the capital available and by working harder. The whole burden of warring falls upon the living generation. The coming generations are only affected to the extent to which, on account of the war expenditure, they will inherit less from those now living than they would have if no war had been fought. Financing a war through loans does not shift the burden among the citizens. If the whole expenditure had to be provided by taxes, only those who have liquid funds could be approached. Short-term loans can be instrumental in removing such inequalities as they allow for a fair assessment on the owners of fixed capital. The long-term public and semipublic credit is a foreign and distributing element in the structure of a market society. Its establishment was a futile attempt to go beyond the limits of human action and to create an orbit of security and eternity removed from the transitoriness and instability of earthly affairs. What an arrogant presumption to borrow and to lend money for ever and ever, to make contracts for eternity, to stipulate for all times to come! In this respect it mattered little whether the loans were in a formal manner made irredeemable or not; intentionally and practically they were as a rule considered and dealt with such. In the heyday of liberalism some Western nations really retired parts of their long-term debt by honest reimbursement. But for the most part new debts were only heaped upon old ones. The financial history of the last century shows a steady increase in the amount of public indebtedness. Nobody believes that the states will eternally drag the burden of these interest payments. It is obvious that sooner or later all these debts will be liquidated in some way or other, but certainly not by payment of interest and principal according to the contract. A host of sophisticated writers are already busy elaborating the moral palliation for the day of final settlement. The fact that economic calculation in terms of money is unequal to the tasks which are assigned to it in these illusory schemes for establishment of an unrealizable realm of calm removed from the inescapable limitations of human action and providing eternal security cannot be called a deficiency. There is no such things as eternal, absolute, and unchanging values. The search for such a values is vain. Economic calculation is not imperfect because it does not correspond to the confused ideas of people yearning for a stable income not dependent on the productive processes of men. Source: Ludwig von Mises. Human Action. The Root of the Stabilization Idea. 225-229. Sain jokin aika sitten vihdoin luetuksi Koneen Ruhtinas - Pekka Herlinin elämä teoksen. Kirjan voi luokitella suomalaisessa talouselämässä pakolliseksi luettavaksi niin merkittävästä henkilöstä Suomen taloushistoriassa on kyse. Pekka Herlin oli Suomen talouden kiistaton suurmies ja KONEen tarina kansainvälisenä menestystarinana hakee vertaistaan. 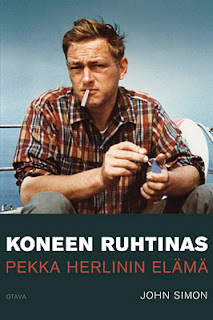 John Simonin kirjoittamaa elämänkertaa on kehuttu runsaasti. Näihin etukäteiskehuihin nähden kirja oli itselleni lievä pettymys. Ensinnäkin on tärkeä ymmärtää, että kyseessä on nimenomaan henkilöhistoria ja persoonakuva, ei niinkään tarina yrityksestä. KONEesta kiinnostuneille kirja tarjotaa toki paljon kiinnostavaa taustatietoa, olihan yhtiö aikanaan yhtä kuin Herlinit. Henkilötarinana Pekka Herlinin elämä ei jätä taatusti ketään kylmäksi. Pekka Herlin oli kirjan mukaan persoona isolla P:llä. Kirjaa lukiessani ainakin itse mietin jatkuvasti, miten Pekka Herlinin käytös vaikutti hänen läheisiinsä. Alkoholismi, jääräpäisyys ja äkkipikaisuus eivät tehneet hänestä helppoa ihmistä. Ulkoista menestystä tuli suurista vaikeuksista huolimatta, mutta samalla toimintatapa aiheutti myös pysyviä sisäisiä ristiriitoja. Noin 400-sivuinen kirja antaa odotuttaa itseään aina loppusuoralle saakka ennen kuin päästään kunnolla asiaan. Silloin nimittäin käydään läpi KONEen sukupolvenvaihdos, jossa valta siirtyi Pekalta Antti Herlinille. Sukupolvenvaihdos ei todellakaan ollut minkään oppikirjan mukainen. Pikemminkin päinvastoin. Kuitenkin se osoittautui toimivaksi - toki riippuen siitä, kenen silmin asiaa katsoo. Mitä Pekka Herlinin elämäkerrasta voi oppia? Ensimmäinen opetus on yhtäläisyys maanviljelyn ja yritystoiminnan välillä. Omistajuus ja maanviljely ovat molemmat kylvämistä, kasvattamista ja pitkäjänteistä sadonkorjuuta. Hyvä maanviljelijä on usein myös hyvä omistaja. Toinen tärkeä opetus on huomata, että suunnitelmallisuus ei ole ainoa tie menestykseen vaan on kyettävä elämään hetkessä. KONEen historia on ollut useaan otteeseen hiuskarvan varassa ja asiat olisivat voineet päätyä totaalisesti toisin. Usein näissä tilanteissa on toimittu enemmän tunteen kuin tarkan suunnitelman mukaan. Kun ei ole tuntunut oikealta, ei ole toimittu. Kolmas opetus on opetus siitä, että ei kannata luopua liian aikaisin. Herlineille KONEen omistajina tarjoitui useaan otteeseen mahdollisuus myydä osuutensa ja tehdä yhtiöstä huima tili. KONEtta ei kuitenkaan myyty. Ei haluttu luopua. Vaikka omistajuus tuo mukanaan vastuuta ja vaikeita tilanteita ja myyminen poistaisi omistajuuden stressiä, ei omistajuudesta haluttu luopua. Yritys oli rahaa arvokkaampi. Haluttiin olla omistajia, ei vain pääoman sijoittajia. Sitoutuminen yhtiöön ja sen pitkäjänteiseen kehittämiseen on kantanut hedelmää menestyksenä, joka muuten olisi todennäköisesti jäänyt saavuttamatta. Neljäs opetus on henkilökohtainen. Suuren yrityksen johtajana ja omistajana Pekka Herlin vaikutti varsin yksinäiseltä. Kavereita ympärillä kyllä riitti, mutta vastuunjakajia oli lopulta vähän. Mies oli aika yksin vastuunsa kanssa. Oliko tämä syy vai seuraus hänen käytökseensä?Entä antoiko asema oikeutuksen tällaiselle käytökselle? Olisiko asiat ollut hoidettavissa toisin? Paljosta saa KONE, Suomi ja useat ihmiset Pekka Herliniä kiittää. Osalla on kuitenkin perusteltu oikeus myös toisenlaiseen mielipiteeseen. Some time ago I presented Napoleon Hill's list of major attributes of leadership. Now I finalized that post by adding the 10 major causes of failure in leadership. 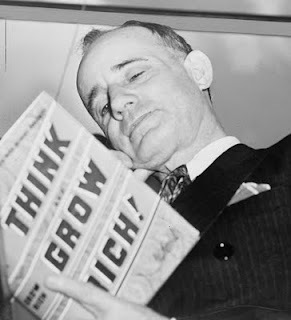 Napoleon Hill's Think and Grow Rich is an old-school classic of self-leadership and personal development. Although it was written a long before Robert T Kiyosaki's and others trainers' books, it is still well known and widely read. Personally I prefer Hill's book to for example Kiyosaki's. Hill gets deeper into people's mind and psychology and states that the success always starts by thinking. You must desire for better before you can reach your goal. Fix in your mind the exact amount of money you desire. It is not sufficient merely to say “I want plenty of money”. Determine exactly what you intend to give in return for the money you desire. There is no such reality as “something for nothing”. Establish a definite date when you intend to possess the money you desire. Create a definite plan for carrying out your desire, and begin at once, whether you are ready or not, to put this plan into action. Write out a clear, concise statement of the amount of money you intend to acquire. Name the time limit for its acquisition. State what you intend to give in return for the money, and describe clearly the plan through which you intend to accumulate it. Hill highlights the importance of positive thinking. He presents his listing of major positive and negative emotions and basic fears. There is one chapter in which Hill presents his ideas on capitalism. Here is how he see it: "The name of the mysterious benefactor of humankind is capital. Capital consists not of money alone, but more particularly of highly organized, intelligent groups of people who plan ways and means of using money efficiently for the good of the public, and profitably for themselves. These groups consists of scientists, educators, transportation experts, accountants, lawyers, doctors, and both men and women who have highly specialized knowledge in all fields of industry and business. They pioneer, experiment and blaze trails in new fields of endeavor. They support colleges, hospitals and schools, build good roads, publish newspapers, pay most of the cost of government, and take care of the multitudinous detail essential to human progress. Stated briefly, the capitalists are the brains of civilization because they supply the entire fabric of which all education, enlightenment and human progress consist. Money without brains is always dangerous. Properly used, it is the most important essential of civilization. A simple breakfast for a city family could not be provided at a reasonable price if organized capital had not supplied the machinery, the ships, the railways, and the huge armies of trained people to operate them. Some slight idea of the importance of organized capital may be had by trying to imagine yourself burdened with the responsibility of collecting and delivering a simple breakfast to the above-mentioned city family, without the aid of capital. The sum of money required for the building and maintenance of the railways and ships used in the delivery of that simple breakfast is so huge that it staggers one’s imagination. Ships and railways do not spring up from the earth and function automatically. They come in response to the call of civilization, trough the labor and ingenuity and organizing ability of people who have imagination, faith, enthusiasm, decision and persistence. These people are known as capitalists. They are motivated by the desire to build, construct, achieve, provide useful service, earn profits and accumulate riches. And, because they provide service without which there would be no civilization, they put themselves in the way of great riches." Kuvitellaan tilanne, jossa sinulla on hallinnoitavanasi 50 miljoonan euron henkilökohtainen ja suvun varallisuus. Valittavanasi olisi kaksi vaihtoehtoa. Vaihtoehto A:ssa toteuttaisit rahoitusteorian mukaista oppia hajauttamisesta ja sijoittaisit salkkusi tuottotavoitteesi mukaisen allokaation perusteella eri omaisuuseriin eri puolille maailmaa. Salkkusi noudattelisi täydellistä hajauttamista yritysriskin, omaisuuseräriskin, ajoitusriskin, maantieteellisen riskin yms. osalta. Oma roolisi olisi minimissään. Voisit luoda hajautussäännön, jonka perusteella salkkusi hoituisi kuin automaattisesti. Vaihtoehto B:ssa ottaisit hajautuksen sijaan näkemystä. Toteaisit, että Helsingin Pörssissä Yritys X ja Yritys Y ovat hyvin potentiaalisia ja sinulla olisi yrityksille annettavaa. Ostaisit molemmista 15 miljoonalla eurolla suurimman osakkeenomistajan aseman ja asemoituisit yritysten hallituksen puheenjohtajaksi. Jäljellä jäävällä 20 miljoonalla eurolla ostaisit ensin Pörssiyritys Z:n osakkeita 5 miljoonalla eurolla saaden myös paikan hallituksessa, 10 miljoonaa sijoittaisit kiinteistöihin, osakkeisiin ja korkopapereihin ja 5 miljoonaa sijoittaisit bisnesenkelinä pörssin ulkopuolisiin kasvuyrityksiin. Salkkusi olisi rakenteeltaan hyvin riskipitoinen mm. yritys-, toimiala- ja maariskin suhteen ja oma roolisi riskien hallinnassa olisi keskeinen. Omalla toiminnallasi olisi vaikutusta sekä kohdeyrityksiin että markkinoihin. Sinulla olisi sekä valtaa että vastuuta. Sijoittamisen kaksi peruselementtiä ovat tuotto ja riski. Näiden välillä vallitsee yleisesti korrelaatio, jonka mukaan suuremman tuoton vastinparina on suurempi riski. Mika Ihamuotilan väitöskirjassa nostetaan kuitenkin esille se tosiasia, että merkittävä osa suurtenkin pörssiyhtiöiden omistajista eivät ole hajauttaneet salkkuaan vaan he pyrkivät hallitsemaan riskiä omalla aktiivisella toiminnallaan. Varsin vähän ymmärretty fakta on se, että sijoittajan ja omistajan logiikat eroavat toisistaan. On eri asia olla sijoittaja kuin omistaja. Sijoittaja on passiivinen, hänen salkkunsa on hajautettu ja hän pyrkii menestymään suhteessa tuottoindeksiä vastaan. Yksi osake on vain rivi hänen salkussaan, eikä hänen toimenpiteillään ole vaikutusta yritykseen tai markkinoihin. Hänen työkalunsa ovat ostaa, pitää ja myydä ja aikajänne on kvartaalitalous. Hänen osuutensa yrityksestä on likvidi. Kun sijoittaja näkee yrityksen edessä vaikeita aikoja, hän myy. Omistaja sen sijaan on yleensä aktiivinen ja hänen salkkunsa ei ole hajautettu vaan usein munat ovat samassa korissa. Hän omistaa yritystä suurella osuudella ja hänen menestymisensä on riippuvainen yrityksen menestymisestä. Omistus yrityksessä tuo hänelle valtaa ja vastuuta ja usein hän antaa yritykselle kasvot. Omistusosuus on niin suuri, näkyvä ja epälikvidi, että sen myymisellä olisi vaikutusta yritykseen ja myös markkinat reagoisivat tällaiseen muutokseen. Omistajan aikajänne on pitkä ja etenkin perheyrityksissä kvartaali on usein 25 vuotta. Vaikeuksien hetkellä omistajan vastuu kasvaa, eikä hän voi paeta vastuutaan. Toisaalta menestys tuo myös kunniaa. Mitä siis riskiin tulee, on olemassa kaksi lähestymistapaa: hajauttaa tai hallita. Piensijoittajalla ei ole valinnanvaraa. Hänen työkalupakistaan löytyvät vain osta, pidä ja myy vaihtoehdot, joten näillä nappuloilla riskin hallinta aktiivisen omistamisen kautta ei tule kysymykseen. Tällöin on vaihtoehtoina joko hajauttaminen tai pyrkimus markkinoiden voittamiseen osakepoiminnalla. Tältä osin 50 tuhannen euron salkun hoitaminen eroaa 50 miljoonan euron salkun hoitamisesta, sillä 50 miljoonan euron salkulla on mahdollista hankkia yrityksistä valta-asemia, joiden kautta pystyy vaikuttamaan yrityskohtaiseen riskiin aktiivisella omistajuudella. Missään nimessä tällainen näkemyksen ottaminen ei aina tarkoita riskin pienentymistä. Päinvastoin, mikäli näkemys yrityksestä on väärä tai luottamus omiin kykyihin ylittää omat osaamisen rajat, voi lopputuloksena olla totaalinen katastrofi. Esimerkkejä löytyy sekä hyviä että huonoja, myös Suomen markkinasta. Lopputulemana voi todeta, että tietyn varallisuusmäärän hallitsija voi hajauttamisen sijasta keskittyä myös riskin hallintaan aktiivisen omistajuuden avulla. Tämä edellyttää oikeaa näkemystä, osaamista ja kykyä luoda lisäarvoa aktiivisella omistajuudella. Tällöin riskit absoluuttisesti kasvavat, mutta niiden hallinasta tulee henkilökohtaista. Toisaalta ilman tällaisia riskinottajia meillä ei olisi upeita omistajatarinoita. Kumpi on sitten parempi tapa? Ei kumpikaan. Riippuu yksilöstä ja hänen tavoitteistaan, kyvyistään ja muista henkilökohtaisista ominaisuuksista, kumpi tapa on sopii paremmin. Hajauttamisen ja hallinnan strategiat voi myös yhdistää eli osa salkusta on aktiivisesti omistettua yritystoimintaa ja loppuosa on tämän kanssa mahdollisimman vähäisessä korrelaatiossa olevia hajautettuja omaisuuseriä. Tämä lienee fiksu tapa esimerkiksi perheyrityksille, joilla on luonnostaan iso osa varallisuudesta kiinni perheyrityksessä. Asiakaslähtöisyys, vastuullisuus, luottamus, turvallisuus, ympäristöystävällisyys, henkilöstöstä huolehtiminen jne luettelee useampi yritys kotisivuillaan ja kalvoillaan. No, mikä on yrityksesi tärkein arvo? Entä mikä on yrityksesi arvo? ...niin siis mikä on yrityksen arvo? Rahassa mitattuna? Kyllä, mikä on yrityksesi arvo? Ehkä se on noin 10 miljoonaa euroa. Mikä suhde on yrityksesi arvoilla ja arvolla? Niin, lisäävätkö yrityksesi arvot yrityksesi arvoa vai päinvastoin? Onko näillä keskinäistä korrelaatioita? Onko yritykselläsi arvoa ilman arvoja? Entä millainen arvo on arvoilla? Voiko arvoja arvottaa eli antaa arvoille arvoa? Entä kenen arvoista ja arvostuksista on kyse? Ovatko arvot subjektiivisia eli yksilöllisiä ja arvioijasta riippuvaisia vai objektiivisia yleisiä arvostuksia? Mitä sinä arvostat? Mille annat arvoa? Mikä on sinulle kaikkein tärkein arvo? Mitä et myisi mistään hinnasta? Onko yritystoiminnan tarkoitus siis luoda määritetyltä arvopohjalta yritykselle arvoa? Vai luovatko kenties asiakkaiden ja muiden sidosryhmien arvostamat yrityksen arvot myös yrityksen arvon? Viimekädessä yritys on yhtä kuin arvonsa. Yksi tuore ajatus riittää tekemään kirjasta lukemisen arvoisen. Saku Tuomisen ja Risto Kuulasmaan Matkanopas teoksen keskeisin idea on, että menestyäkseen kansainvälisesti ihmisen, tuotteen tai palvelun tulee olla tavoitellun kohderyhmän mielestä hyvä ja kiinnostava. Siinä kaikki. Hyvyys ja kiinnostavuus perustuvat aina tavoitellun kohderyhmän mielikuvaan. Yksistään kumpikaan ei riitä menestykseen. Kirjoittajat avaavat ajatteluaan valaisevalla esimerkillä: Louvressa kaikki teokset ovat hyviä, mutta silti vain yksi on suuren yleisön mielestä kiinnostava. Mona Lisalla on maine. Nähdessään Mona Lisan ihminen liittyy sellaisten ihmisten joukkoon, jotka ovat nähneet Mona Lisan. Tämän valaisevan ajatuksen jälkeen kirjassa esitetään joukko esimerkkejä suomalaisista kansainvälistyneistä yrityksistä ja henkilöistä, ja pyritään näiden esimerkkien kautta kertomaan, miten rakennetaan kansainvälisesti hyvä ja kiinnostava kokonaisuus. Yleisnäkemys on, että suomalaiset ovat kyllä ainakin omasta mielestään monissa asioissa hyviä, mutta kiinnostavuuden kanssa meillä riittää tekemistä. Ainakin verrattuna ruotsalaisiin. Kirjassa paneudutaan ylipäätään suomalaisten tyyppipiirteisiin, jotka joko edistävät tai haittaavat kansainvälistä läpimurtoa. Alan itse suhtautumaan skeptisesti kansallisuuden perusteella tehtäviin ihmisanalyyseihin. Okei, myönnän, jotkin piirteet ovat leimallisia suomalaisille kun puhutaan valtaväestöstä. Kuitenkin kun katsotaan tiensä maailman huipulle raivanneita henkilöitä, on kyse loppujen lopuksi ollut massasta erottuvasta yksilöstä. Liikaa ei siis pidä tuudittautua tai asemoida itseään syntyperän määrittämään katerogiaan ja selittää sillä asioita hyvään tai huonoon suuntaan. Esimerkiksi tapasin äskettäin Trinidad&Tobaccossa syntyneen nuoren naishenkilön, joka keskusteluissa osoittautui Sveitsissä asuvaksi tohtoriksi, MBA:ksi, UBS:lla uraa tehneeksi pankkiiriksi, joka nyttemmin johti kansainvälistä tutkimuslaitosta. Voisi olettaa, että jos hän olisi nuorena lokeroinut itsensä tyypilliseksi trinidad&tobacolaiseksi, olisi hänen elämänpolkunsa ollut merkittävästi toinen. Kenties hänestä olisi tullut huippujuoksija. Yhtä hyvin voi myös olettaa, että helpolla hän ei ole tietään Sveitsin pankkimaailmaan luonut, sillä Trinidad&Tobaccon passi ei oletettavasti ole kovinta valuuttaa niissä piireissä. Kuitenkin yksilö ratkaisee ja kuten kirjan kirjoittajatkin toteavat, viime kädessä jokaisen on itse raivattava oma polkunsa. Ajatus hyvästä ja kiinnostavasta menestyksen kriteereinä sai minut miettimään. Tutkimusmaailmassa on ihan selvä, että jos haluaa olla kansainvälisesti menestyvä akateemikko, on oltava sekä hyvä että kiinnostava. Tällä sektorilla Suomessa on kenties joitain hyviä, mutta harvoja kiinnostavia. Kiinnostavuus kun usein edellyttää itsensä brändäämistä ja kykyä tiivistää sanomansa vaikuttavasti suurelle yleisölle. Loistava esimerkki hyvästä ja kiinnostavasta tutkijasta on Richard Florida. Bisneksessä suuntaus on sama. Sekä yksilöiltä että yrityksiltä edellytetään menestyksen eteen sekä hyvää suoritusta omalla alallaan että kiinnostavuutta. Mitä Tuomisen ja Kuulasmaan kirjaan tulee niin on helppo todeta, että se on hyvä ja kiinnostava. Hyvä idea kiinnostavasti toteutettuna.